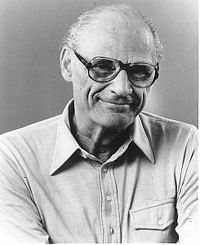 Arthur Miller (October 17, 1915 - February 11, 2005)  was a communist American playwright whose dramas reflected the unrest of the American people after the Great Depression and World War II. His best-known works, Death of a Salesman, and The Crucible, remain cornerstones of American theater to this day. Miller was an atheist. In 1995, Miller stated, "I have no formal religion but there's a space in my head for it. Maybe I would believe in God if he believed in me. But we're living in a reality that's so hard to understand. In the last 75 years the human race has been humiliated in a way we've never known before…"
Born in Harlem to Jewish working-class parents, Miller would be deeply affected by the ruin of his father's business during the Great Depression. He went to the University of Michigan in 1934 to study journalism, where he first began writing plays. Miller returned to New York after graduating, and in 1940, he married Mary Slattery, his college sweetheart. His first play to be produced on Broadway, The Man Who Had All the Luck (1944), was a failure, closing after only four shows. His next play, All my Sons (1947), did considerably better, earning him a Tony Award. It would be Death of a Salesman, however, that established Miller as a major artist in the world of theater. Produced in 1949, the play tells the story of Willy Loman, an aging salesman whose desperate clinging to his vision of "The American Dream" blinds him to reality and eventually tears his family apart. The play would earn Miller a Pulitzer Prize, and its first run earned six Tony Awards. His next major work was The Crucible, produced in 1953. Mired in controversy in its day, it is a fictionalized account of the Salem Witch trials of the late 17th century, which deliberately attempted to allegorize the diligent anti-communism of the McCarthy era. He would later be called before the House Committee on Un-American Activities, but refused to give any names of those suspected of supposedly anti-American or Communist activities. Miller was briefly married to film star Marilyn Monroe between 1956 and 1961, but the couple divorced shortly before the film star's death. In 1962 he married photographer Inge Morath, to whom he remained married until her death in 2002. During his marriage with Inge, they also had a son, of whom Miller forced Inge to put into a mental institution due to his having Down Syndrome, and unlike Inge, he never made any attempt to visit his son. During this time, Miller continued to write plays, but by the 1970s, his output slowed considerably, although he remained politically active. He died in 2005 of heart failure. Miller remains a towering figure in American drama today, and his works are the subject of much in-depth analysis in academic circles. In 2002 he was awarded the Prince of Asturias Prize for Literature in Spain, the first American to receive this prestigious award. There, he was named "the undisputed master of modern drama".